Ambulatory blood pressure (ABP) monitoring involves measuring blood pressure (BP) at regular intervals (usually every 20–30 minutes) over a 24 hour period while patients undergo normal daily activities, including sleep. 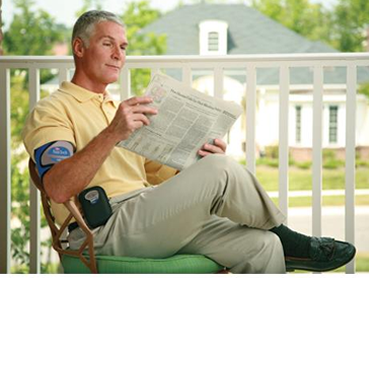 The portable monitor is worn on a belt connected to a standard cuff on the upper arm and uses an oscillometric technique to detect systolic, diastolic and mean BP as well as heart rate. When complete, the device is connected to a computer that prepares a report of the 24 hour, day time, night time, and sleep and awake (if recorded) average systolic and diastolic BP and heart rate. The accuracy of ABP monitoring has been validated in a range of patients including young, elderly, pregnant and obese subjects (provided the correct size cuff is used). Ambulatory BP monitoring is safe and is not usually associated with complications. Occasionally oedema or petechiae of the upper arm or bruising under the inflating cuff may occur. Modern ABP devices are quiet, lightweight and easy to wear, but inflation of the cuff may cause some transient discomfort, particularly in people with hypertension or when multiple readings are triggered due to errors in measurement. Ambulatory BP measurements during the night may disturb sleep; potentially requiring retesting if there are poor nocturnal BP measurements. hypotension, where this cannot be demonstrated in the clinic. Patients should be aware that the device will automatically inflate the cuff and measure BP periodically over a 24 hour period. They will need to book to have the monitor fitted and, as they cannot get the device wet, they should attend after bathing. A top with loose sleeves will best accommodate the cuff and a firm waistband will help support the monitor. Patients should continue with their normal daily activities, preferably including a work day rather than a rest day. They should take all their usual medications. When the cuff starts to inflate the patient should stop moving and talking, keep the arm still and relaxed, and breathe normally. They should avoid activities that may interfere with the device such as vigorous exercise. A brief diary is important to record timing of activities, sleep, taking of medicines, posture and symptoms (eg. dizziness) that may be related to BP. No Medicare rebate is currently available for ABP monitoring. Costs will vary with provider and need to be discussed with the patient.